Sensex and Nifty 50 are proof. Even though they tumble in midst of volatile scenarios the surely recover well in long term. Stock markets is a world within itself, it is a tool for transferring money from the impatient to the patient, said a very wise investor once. When you invest in equities there is a sudden change in your behaviour as well, either you are often among those who panic every time volatility hits markets, or you are among those who tries to read between the lines the real message stocks are sending. Equities across the world have given some examples, where they have been proven to be the best investment option. This is one of those elements that lead to cracking the code of equities, breaking out its secret and deploying it for personal benefit. Rather than racking your brain over which investment options you should opt to invest your hard-earned money, here’s a lesson as to how you can actually become just like one those big investors mentioned in this article. With examples, let’s study how you can become a billionaire by investing in right stocks in right time. First, remember, that stock exchanges are meant for long term. Diversify yourself, book some gains invest in other money making companies. Think beyond the nature of current situations of markets. Sensex and Nifty 50 are proof. Even though they tumble in midst of volatile scenarios the surely recover well in long term. For example, Sensex was trading near below 5,500-mark way back in 2000. It’s value was at 5,375.11 on January 03, 2000, but it later grew to 11,915.24 level on April 04, 2006. This was in a span of six years, Sensex more than doubled making many investors rich. 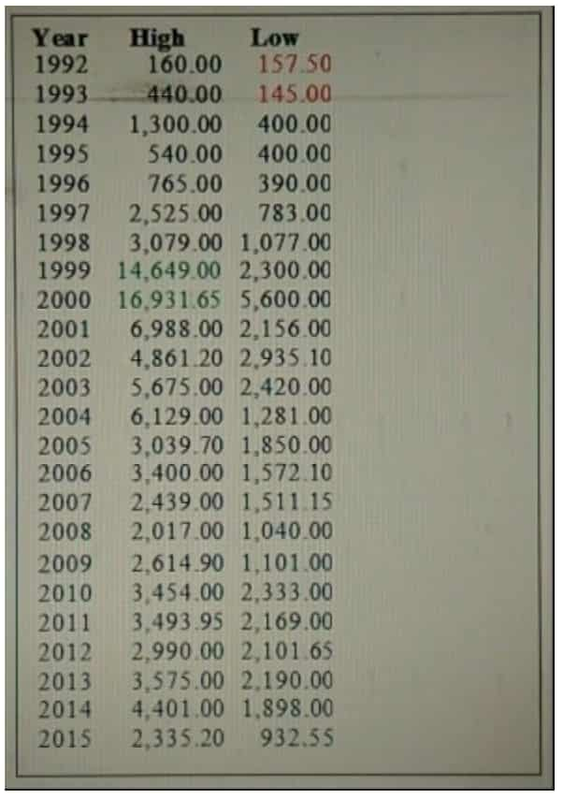 The performance Sensex was not limited till that, the benchmark further raised to surprise 14,478.19 on February 02, 2007, this was with just one years time before it reached over 11,000-level. Sensex did see lapses in performance, as it witnessed a nosedive on March 13, 2009 (during global crises) where it plunged to 8,756.61. But it recovered almost within a few months time, as it was back over 15,411-mark on August 14, 2009. By start of January 2010, Sensex was already over 17,500-level. It took less than 10 months for Sensex, to clock over 20,000-level by end of October 2010. 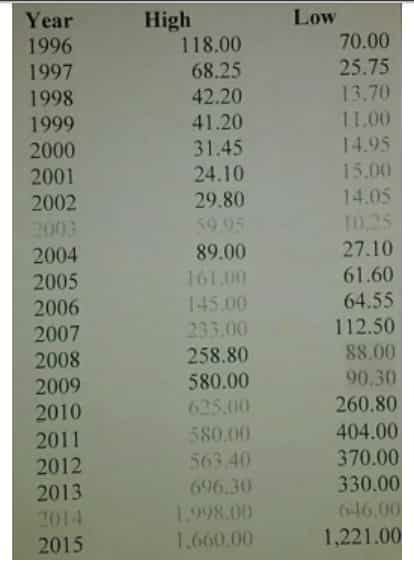 In less than a decade, Sensex gave a return of 272.14% if we look its January 2000 numbers. Then Sensex managed to hover between 15,000-mark to 20,000-level for three years time, until it reached by nearly 26,000-mark in July 2014. By beginning of January 2015, Sensex was already racing for 30,000-level, as it was at 29,231.41 on February 20, 2015. Then immediately it relaxed and traded between 25,000 to below 30,000 level for another two years, until the index clocked over 30,750.03 on May 25, 2017. This was a growth of over 472% in just 17 years. 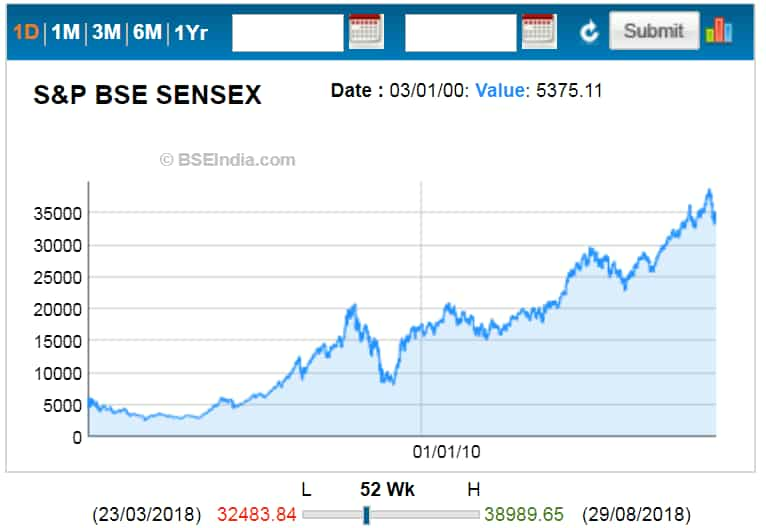 This year in 2018, Sensex has clocked an all-time high of 38,989.65, making a gain of 625.37% or 7.25 times or 33,614.54 points gain in span of 18 years, if we look at January 2000 level. Nifty 50 too had a similar roller coaster ride, it was trading near 1,600 mark in January 2000 raised further to over 6,200-level during the global crises in January 2008, and then further over 8,800 mark in February 2015. In 2017, Nifty 50 clocked over 9,000-mark, but it did not take time to begin January 2018 with over 11,000-level. That was the fastest gain made by Nifty in one year’s time. In August 2018, Nifty 50 touched an all-time high of 11,470.75, which makes it gains of over 616% or 7.16 times or 9500 points. In short! Markets are always bound to rise in longer term. It’s more like a fact! Many of us consider stock market is like a lottery ticket, where some earn hefty amounts while most lose massively. One of the habits of investors is that, some purchase a stock just because everybody else is doing, or there is a buy call which gives some sort of satisfaction on investing. But in reality, a person who invests in a stock, is actually an investor in a company, which means he also has a partial ownership in the entity. Yes sometime, the company you have invested might give you a scare in short term, but in longer term as the business gains in terms of valuation, the stock definitely performs well. Make most of a crash! One key strategy of investors like Jhunjhunwala, Lynch and Buffet is that they make most of opportunities on offer when stock markets crash. They invest big in companies when their stock prices are crumbling to lowest, keeping them as long term investment. There can be risk, if investing without knowing a company during a crash. 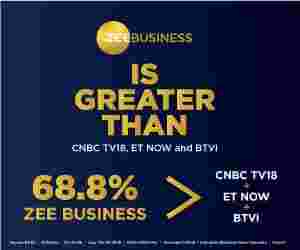 However, when a new business whose future is bright is merely cheap due to stock market crash and old business whose product has a constant demand throughout the century is merely cheap because of bad news phenomenon gives a good investing opportunity. It is actually true, investing in bad times is a multibagger. Whenever there is a recession or markets are down, and every other stock is plumbing the lows following the trend of the benchmark indices. This can make for a fine investment opportunity as the company's valuation has fallen below its potential level. The company with better foundation, low or zero debt and good management, will also tumble and investors need to recognise the opportunity and seize the moment for making the investment. Unfortunately, what happens is that when markets are down, investors start to sell believing that there is not much left in that particular stock, this opens the door for a value investor who recognises the opportunity to make money. Fast growers - small, aggressive new companies growing 20-25% or more. Slow growers - raising earnings at about the same rate as the economy, about 2-4% a year. If it’s a low percentage,the company has a cushion in hard times. It can earn less money and still retain the dividends. If it’s a high percentage, then the dividend is riskier. Stalwarts - good companies with solid EPS growth of 10-12%. These are big companies that aren’t likely go out of business. Cyclicals- whose earnings rise and fall along with the economy's boom and bust cycle. If you know your cyclical, you have an advantage in figuring out the cycle. Turnarounds - companies with temporarily depressed earnings, but goodprospects for recovery. 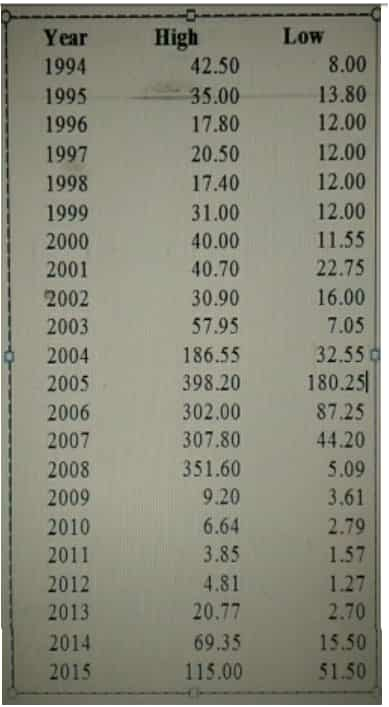 VST Tillers back in 2003, was trading at all-time low of Rs 10.25, the ones who made an investment in this company when it was doomed have gained 16 times of their investment amount in just 2 years and 62 times in 7 years and more than 200 times in 11 years. Guess what! VST Tillers has clocked an all-time high of 3,085 on April 24, 2018, this makes it gains by a breathtaking 29,997.56% or 300.97 times from its 2003 lows. Between 1994 to 2003, Marksan was trading to as low as 12-40. If any investor had invested during that time would see their money double or triple in 1 - 2 years. 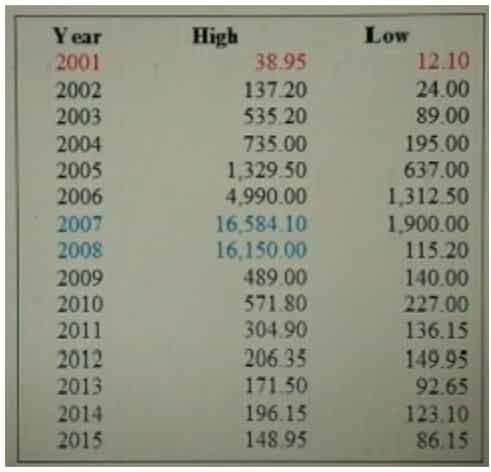 In 2003 it was trading at merely Rs 7.05. those who had bought at this level got more than 50 times return in next 2 years. In 2005, it had all-time high of 398.2 which makes it gains over 5,548.22% or 56.48 times in two years. Your Rs 1 Lacs investment became over Rs 55 Lacs in just 2 years. Currently, Marksan is backed to penny level, as it trading near Rs 30 to Rs 50 this year. This surely makes for an investment opportunity for long term, looking at its potential. This government-owned stock was just trading below Rs 12.10 in 2001, however, did not backed away in giving more than 1300 times return in 8 years. The company was trading around Rs 16,000 in 2007-2008. Then it split. In 2007, this stock clocked an all-time high of 16,584.10 and if we look at the all-time low of 2001, then this company has give a whopping 136,958.67% or 1,370 times return to its investors during the time global crisis shockingly. Those who have invested Rs. 1 Lac in 2001, got more than Rs.13 Crores in just 7 Years. Currently, the company is back near 100-mark, however, its potential is optimistic. This IT-giant comes as a best bet because of its continuous growth and zero debt are the reason for performance. The stock split in 2006. During 1994 to 2015 it has given bonus shares many times. Some of the reason behind the above mentioned stocks increase and decrease in the prices would bonus shares, dividends, price change after splitting which are not calculated. From the above, it can be truly said to earn good profit is selection of stocks and buying it at the bottom and holding it for long term so that its valuation increases and it gives multibagger return.